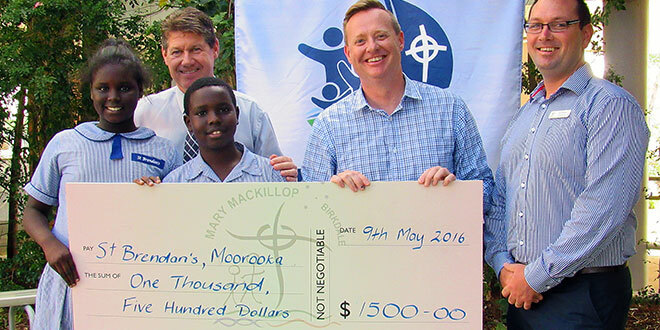 Solidarity: St Mary MacKillop principal John Spillane (back) and assistant principal for religious education David White (right) present a cheque for $1500 to St Brendan’s students Lawra Angta and Tim Oukelo and acting principal Craig Acret. ST Brendan’s Catholic Primary School, Moorooka, learnt the true meaning of solidarity when St Mary MacKillop School, Birkdale, presented it with a cheque for $1500 for its sports program. Year 6 students at St Mary MacKillop had finished an integrated unit of work which had touched on the Catholic social teaching principle of solidarity and wanted to put what they had learnt into practice. Based on their classroom studies the students came up with the idea that they should look to create partnerships with other school communities that would benefit from some practical support. That was when they heard about the needs of the St Brendan’s sporting program. St Mary MacKillop assistant principal for religious education David White said once the students were made aware of the specific needs of the St Brendan’s community they were keen to help. He said applying social action and justice required two important dispositions – empathy, the capacity to stand in the shoes of another; and solidarity, the capacity to walk with another. “When the students were made aware the community of St Brendan’s needed some assistance to enhance their resources to further develop the sporting program they knew they had to help,” he said. St Brendan’s acting principal Craig Acret was pleased with the financial support offered and said it would be put to good use. He said St Brendan’s had a strong enrolment of just under 100 students in a growing and strengthening community in a suburb that was starting to see signs of rejuvenation. “We are very proud of the success of our students,” he said. “We have a large number of very gifted and talented students here from diverse backgrounds and as a school community we have been looking for ways to further develop our sporting success. “It is fantastic that the community at St Mary MacKillop, Birkdale, have been willing to support our students this way. St Mary MacKillop principal John Spillane said as part of the school’s annual outreach it looked for practical ways to enhance educational outcomes for students and their local communities. “Our students believed that their support would make a difference to the lives of children just like them,” Mr Spillane said.